I have finally caved in to the extreme pressure from the little army of camouflaged shoppers in my head and have purchased some new clothes for my Summer Abroad. Three weeks and one day to go and I had been doing so well, quietly lusting after crop tops and patterned vests but today I gave in and bought three tops and a pair of high waisted denim shorts from Topshop. 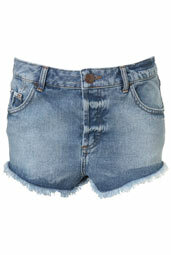 ﻿﻿High waisted and frayed, these shorts are bang on the festival girl trend. The high cut on the legs makes my short legs look a teeny bit longer! 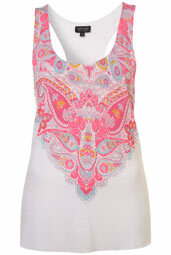 A bright twist on a paisley inspired print. Low cut to flatter fuller figures. Thin fabric with unfinished edges make it a perfect mix of beach cool. 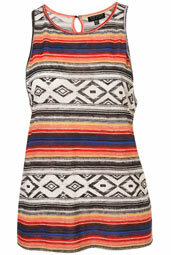 Missoni and Aztec inspired print makes this a perfect staple for summer as prints are in again. More is less once again as crop tops become big news for summer. Well we don’t want our tummies getting hot! The light cream colour is perfect for beachy tans and not as harsh as white. To be honest I am very proud of myself and my willpower since I tried on another two tops that I liked and actually managed to decide against them. Next on my shopping list – sunglasses! I will definitely be the best dressed worker in Mallorca this summer!